The C-Class has received countless technological advances in even more seductive style for 2019. The heavily upgraded 2019 C-Class is an amazing car, but there are also others that are even better. This Mercedes comes equipped with several engine options, but all wring out satisfying power. However, the C-Class is not sporty as rivals. What you may like about this particular vehicle is its luxurious ride and spacious cabin. Inside, you will find yourself in the ocean of elegant materials. The list of standard and optional features is extensive. All you can complain about is some distracting infotainment controls and a second row that’s just so-so on space. The 2019 Mercedes Benz C-Class sedan allows for five passengers, while coupe an convertible models accommodate four. The front seats give you incredible comfort, providing impressive lateral support and bolstering for taking curves. In sedan, rear-seat offers decent amount of space back there, provided the front-seat passengers don’t push their seats back too much. The second row in the C-Class coupe and convertible are little constricted, however, with only two doors, it becomes a little difficult for adults to get in and out of. The Mercedes C-Class offers two complete sets of Latch child seat connections in its second row. In five-seat sedan models, you will find an additional tether anchor for the middle seat. The lower anchors can be easily found since they’re located under plastic flaps and not wedged in the seat cushion. A little bit of effort is required to attach the seat straps to the anchors. An elegant cabin is what defines the C-Class. The new 2019 has not received too many changes to the interior quality and design, largely because none were needed. Real wood trim pieces offer a retro futuristic look to the doors and center stack. The standard leatherette upholstery is comfortable, while more sumptuous options like Nappa leather are available. On the whole, the opulent, modern, and sleek cabin is one of the most amazing addition to this class. The 2019 C-Class sedan boasts of 12.6 cubic feet of trunk space, which is about average for the class. Both the BMW 3 Series and the Audi A4 offer more room of 13 feet. The C-Class coupe’s trunk has 10.5 cubic feet of space.Volumes shrink as long as 8.8 cubic feet in Carbriolet models. A split folding rear seat is standard, and a power trunk lid is optional. Mercedes vehicles never go out of date, especially when it comes to in-car technology. With 2019 update, the C-Class brought a whole lot of improvements. Android Auto and Apple CarPlay are now standard in all models. These smartphone integration systems can be used as an alternative to the infotainment system’s regular controls. This new feature eliminates the need to use the physical knob on the center console and the available touch-pad. Besides, it is hard to navigate the menus as well. Another major improvement is a new 10.25 inch display screen. Though it is optional in the base C300 sedan, it comes standard in coupe, convertible, and AMG models. The 7-inch screen mounting atop the dashboard received some adverse feedback from the Mercedes Benz Greensboro auto experts. The 10.25 inch screen has a similar positioning, but its larger size and rectangular shape goes well with the dash and interior layout. You can also go for a 12.3 inch digital instrument cluster, which offers more of a cockpit feel to the car. You can see everything from navigation to speed, and other theme oriented items through it. The Supersport setup, for example, introduces a tachometer in the middle of the display and a digital speedmeter in the center of that. 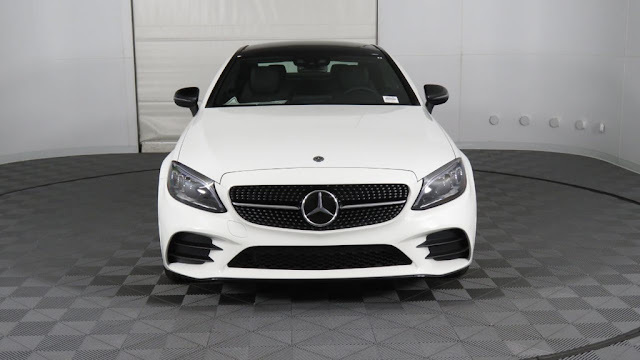 The new 2019 C300 comes equipped with a 2.0 liter turbocharged, 255 horsepower four cylinder engine paired with a nine speed automatic transmission. The engine has been refreshed from the base four-cylinder engine in the 2018 C-Class that delivers 241 horsepower. The C300 produces a massive power for daily driving, whether you are traveling at a closely destination or cruising around at highway speeds. The transmission offers quick and smooth shifts. It would unfair not to mention the marvellous engine options in the high-performance AMG models. The AMG C 43 is offered with a 3.0-litter twin turbocharged V6 that cranks out 385 horsepower, an increase of 23 from the 2018 model. The AMG C 63 comes equipped with a 469-horsepower twin turbo 4.0 litter V8, while the AMG C 63 S has got the same engine, delivering 503 horsepower. All C-Class AMG models boast of a nine-speed AMG transmission with different gear ratios than the standard transmission. Overall the car is impressive. To keep the vehicle running strong, be sure to take the your Mercedes Benz C Class to your nearby Mercedes-Benz service Greensboro center.